RBTH presents a selection of views from leading Russian media on international events, featuring reports on the EU’s new Energy Union and Russia’s proposal to form a parliamentary assembly for the BRICS nations, as well as a U.S. forecast about North Korea’s growing nuclear threat. 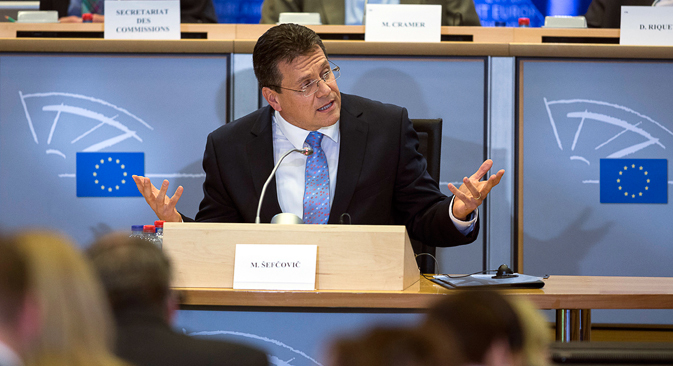 The centrist Nezavisimaya Gazeta daily reports that EU Energy Commissioner Maroš Šefčovič has presented the concept of the EU’s new Energy Union at a meeting in Brussels. The need for a common European energy policy emerged as early as in the past decade and has been directly linked to the first Ukrainian gas crisis [in 2009 – RBTH], the newspaper writes. Now it is a matter of a new strategy for European energy security; the need has arisen due to the conflict between Gazprom and Ukraine’s state oil company Naftogaz, which resulted in the reliability of gas supplies from Russia to the EU being threatened. "The main motive for the creation of the Energy Union is to reduce dependence on Russian gas and to prevent 'gas blackmail' on the part of Moscow," Nezavisimaya Gazeta writes. The main content of the Energy Union will be the creation of a common energy market, the integration of the EU’s national gas transportation systems and the provision of infrastructure that will unify energy networks primarily in the Balkans and Central Europe. In addition, the EU will lose part of its energy policy sovereignty in favor of the European Commission. The EU is counting on the assumption that the new pan-European association will strengthen Brussels’ bargaining position in negotiations of new gas contracts with Gazprom. The EU will also try to establish a partnership with alternative suppliers, such as Azerbaijan and Turkmenistan, with which Brussels is planning to sign the so-called memorandum of understanding in 2015, the newspaper reports. A parliamentary assembly for the BRICS countries (Brazil, Russia, India, China, South Africa) may be created in the near future on Russia’s initiative, the Izvestia daily broadsheet reports, citing a source in the State Duma. The proposal will be discussed during State Duma speaker Sergei Naryshkin's visit to India on Feb. 26-27. According to Izvestiya’s source, relations between India and Russia have so far not been active – or rather, as interesting – in the inter-parliamentary sphere as in military and trade cooperation. Naryshkin’s visit should serve as some kind of compensation for this, the newspaper writes. The newspaper reminds its readers that the BRICS association of five major emerging national economies was created on Russia’s initiative in 2010. One of the first BRICS institutions was the new Development Bank, intended to finance infrastructure projects and sustainable development projects in BRICS nations and developing countries. A parliamentary assembly for the BRICS countries could serve as another important structure within the grouping, Izvestia writes. U.S. researchers have prepared a forecast of the development of the North Korean nuclear program for the next five years, the business daily Kommersant reports. According to the experts, North Korea's nuclear arsenal may grow to 100 warheads by 2020. This is the "worst case scenario" issued by the researchers of the program Nuclear Future of North Korea. North Korea does not say how many nuclear bombs it currently has at its disposal, but, according to experts, it has 10 to 16 nuclear warheads, of which six to eight are made of plutonium and four to eight of weapons-grade uranium, the newspaper says. Kommersant reminds its readers that in February 2013, North Korea conducted a third nuclear test and has since threatened to conduct another in order to "deter U.S. aggression." According to U.S. scientists, the Democratic People's Republic of Korea (DPRK) will be able to produce a limited number of Taepodong missiles (a militarized version of a space launch vehicle) capable of reaching the United States in the future, Kommersant writes. According to the U.S. Department of State's Special Representative for North Korea Policy Ambassador, Sung Kim, the United States "has no illusions" about North Korea's willingness to voluntarily give up its nuclear program, therefore, will continue to exert pressure on the North Korean authorities through sanctions, the newspaper writes.